Convenience is one of the biggest selling points for any online store, and your website needs to reflect this fact. By creating your store with the right Ecommerce application, you can create an incredible user experience that turns causal visitors into loyal customers. You need to use multiple strategies to discover what works best for your target audience. Ecommerce design plays an integral role in helping your site appeal to visitors. This means more conversions! A simple and easy-to-use shopping experience is a must for any Ecommerce site. With these, a customer can go through a website and pick and choose the products they want. A good checkout process is also important. You’ve seen both of these in action if you’ve ever purchased something from Amazon.com. Platforms like Magento, Shopify and WooCommerce all have extensions that are designed to enhance the user experience. We’ll be able to implement these on your website. People don’t usually have long attention spans. If they get confused when trying to purchase something online, they’ll probably just give up and look elsewhere. That’s why ecommerce applications have been fine-tuned to be as simple as possible. Having an excellent Ecommerce setup means that customers are more likely to go through the entire purchasing process. Not only that, but they’ll remember the convenience and go back to your website when they want something else. We have an experienced web development team that can build the ecommerce applications that your website needs. Call HeyGoTo now to learn more about these services and how they can help you. Due your best to enhance user experience. 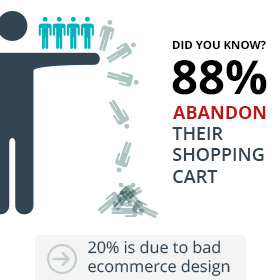 Visitors are more likely to return to websites with good ecommerce functionality. Great design increases conversions by making it easier to make purchases. It’s about time you got more. Get a free Ecommerce evaluation.